grocery shopping (including the drive), and another 30 minutes or so actually making dinner. It's easy to get frustrated over this routine. The two best ways to make healthy, homemade meals during the week are to take a break before starting to cook and to use online grocery to help with meal selection, planning, and grocery deliver. Don’t walk in the house after work and immediately start cooking. Take a few minutes to relax and catch your breath. If you immediately start cooking you’ll be completely exhausted (and maybe even cranky) by the time you sit down. Instead, put out some healthy snacks as a first course. After that, you'll be more relaxed while you get dinner on the table and sit down with the people you care about. Using online grocery is a classic life-hack. Plain and simple. It can save you time and money. Other online grocery services like Chicory can help you find healthy meals and cook new, adventurous foods to break the monotony of your weekday suppers. Online grocery shopping can be a big help in cutting out all the steps except for actually making the food. There are lots of amazing online grocery services out there and the business is only getting bigger - giving you better quality, wider variety, and more reasonable delivery times. There are even online grocers that deliver within an hour. Pretty amazing, right? We're excited about Chicory because it lets you take a breath and use online grocery without having to think twice about what to make, if you bought the right stuff for the recipe you were looking at or if you forgot an ingredient for tonights meal. We take care of it all. 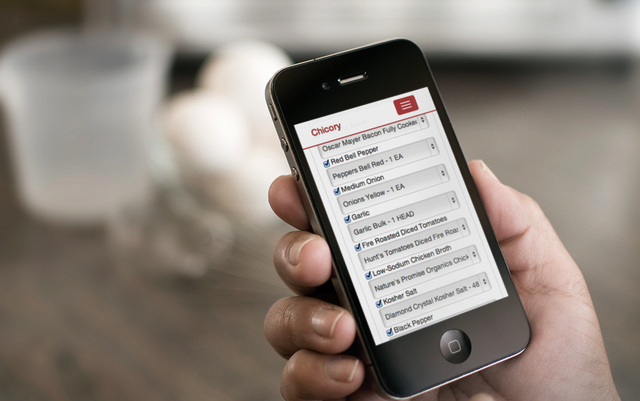 So take a breath and get notified when Chicory goes live in your neighborhood.